It’s Monday. The week has started again, and we are excited to be back digging. 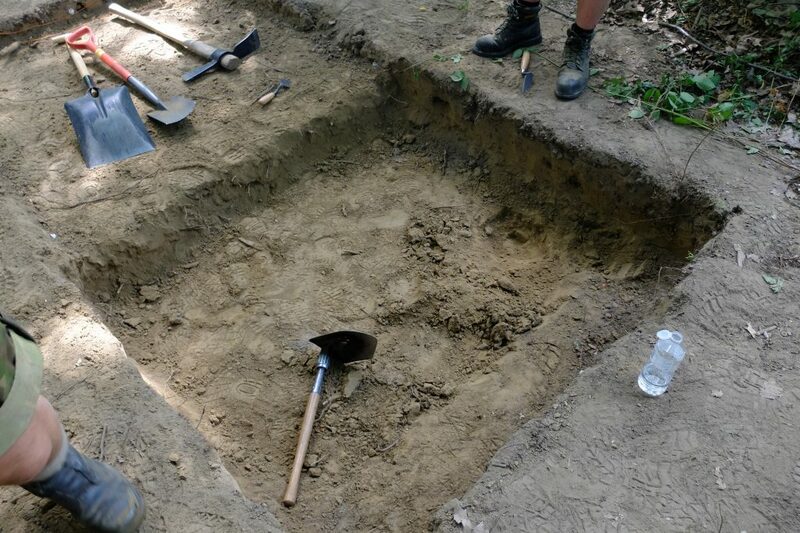 Today, there’s more evidence for how archaeology creates as many new questions as answers. Keep reading to see what we’ve found! Some trenches have been covered over again as our work there is concluded -for now. The ‘Pond’ turned out not to be not‐quite‐a‐pond: it may be a pit made to extract clay and building materials for the construction of the original farm. It probably filled up with water in rainy seasons. Given the night of heavy rain that preceded the battle, it was likely to have been full of water then and soldiers coming down to reinforce or resupply Hougoumont would have had to go round the obstacle. We did find many objects of the late 19th-early 20th century, mostly broken bottles, but little direct evidence dating from the battle -for now. 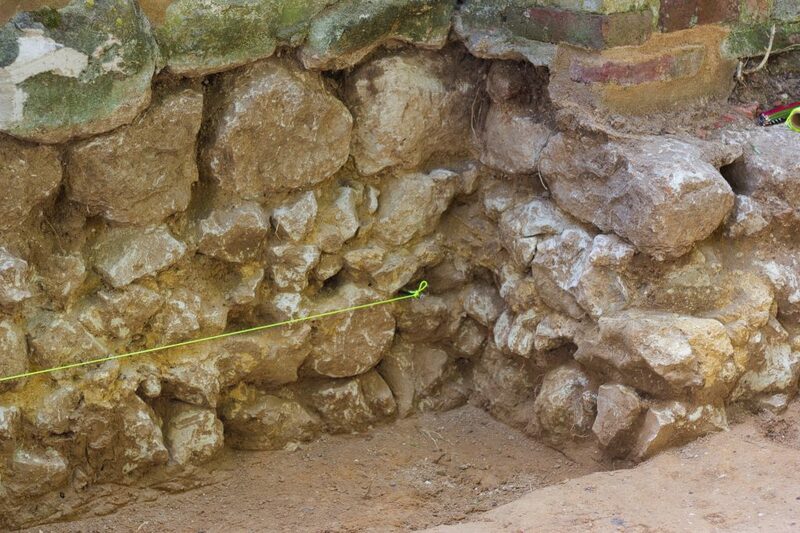 The trench inside the Garden Wall gave us all we wanted to know, and was closed off again. 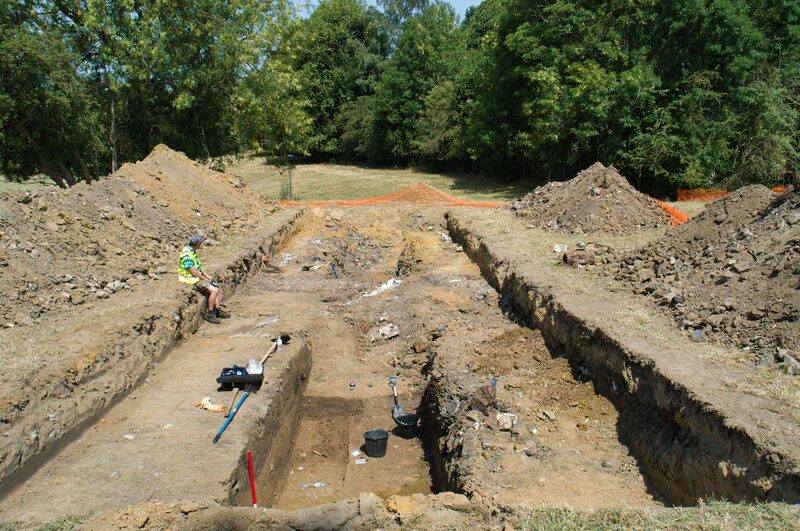 Excavations continue on the other side of the Garden Wall in the Killing Zone to find out how broad the original wall was at the time of the Battle. The area proposed for the new Car Park has been filled up again, after providing us with an interesting collection of musket balls, buttons, and coins, and some finds which might relate to the medieval history of Hougoumont..
At the Northern Gate, excavations continue, exposing ever more of the original barn (with slates, not tiles!). And some extremely interesting finds from the battle are starting to emerge. Waterloo Uncovered is extending its work to new areas of the battlefield. Less than two kilometres away, lies the strategically important outpost of La Haye Sainte farm, astride the main Charleroi to Brussels road. This road became an axis for the main French attacks. Across the road and slightly to the North of the farm, we have been allowed to dig new trenches to look for the site of the Sandpit. 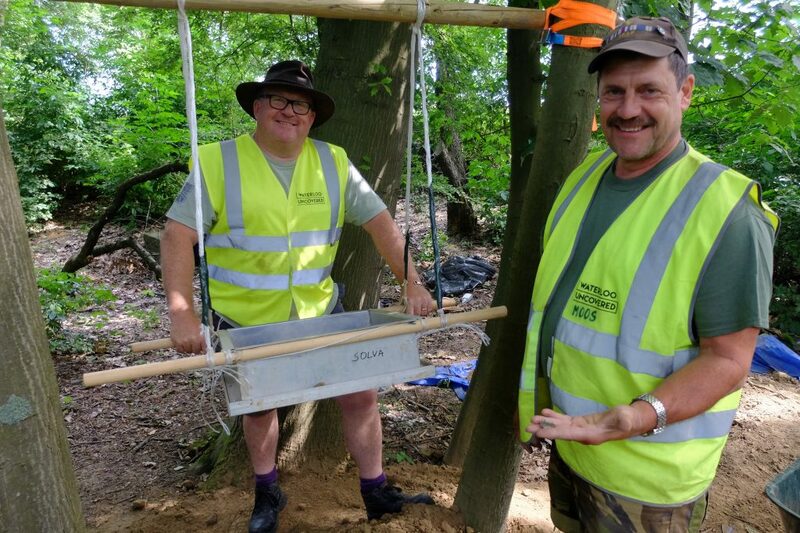 This important feature, used to extract sand for local buildings, was held for much of the battle by a famous British Regiment, the 95th Rifles. We’re finding musket balls fired at them by the attacking French forces as well as outgoing British rounds. Contemporary pictures of the Sandpit in the aftermath of the battle show it being used as the site for a grave pit. Further excavation will be needed to confirm this. Following the road South towards Charleroi, you come to La Belle Alliance, an inn from where Napoleon surveyed the battle. In the evening of 18 June, 1815, in the dying minutes of the battle, it was the site of the meeting between the two victorious commanders, Wellington and Blucher. A field of corn stubble tells a story of heroism and slaughter. 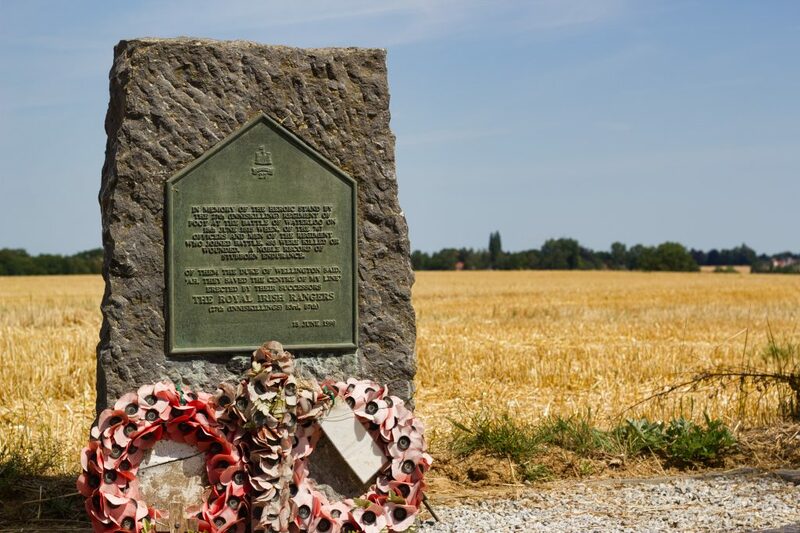 Above the farm of La Haye Sainte, and close to the Sand pit, the British line was held by a regiment from the North of Ireland, the Inniskilling Fusiliers (27th Foot). They arrived at Waterloo just in time to take part in the battle, having marched directly from the ships bringing them from America, where they had been serving. Their fate was a tragic one. Nearby French cavalry forced them to form square -a formation that offered protection from horsemen behind a dense wall of bayonets, but whose crowded ranks made them very vulnerable to cannon fire. Late in the battle, when the French finally captured the farm of La Haye Sainte, they were able to bring up their guns to within three hundred metres of the Inniskillings Square. The result was carnage, as the Inniskillings’ ranks were blasted by shot and shell. Of the 750 men on the field, 450 were killed or wounded -one of the highest casualty rates of any Allied unit in the battle. 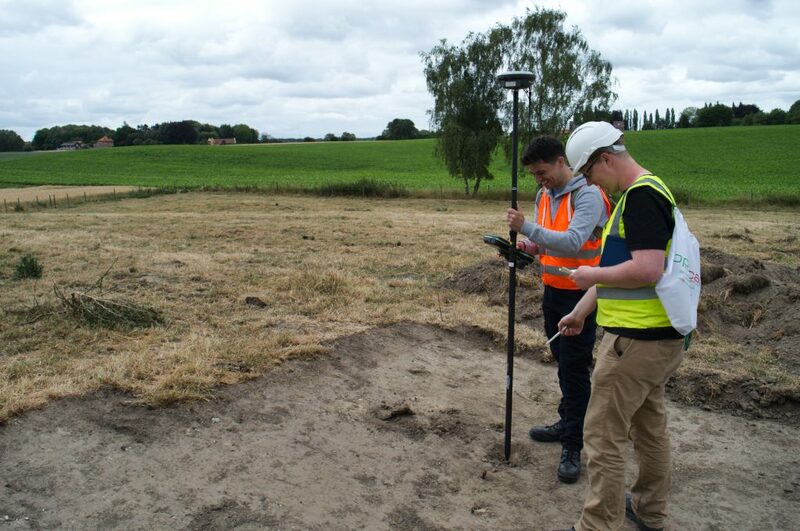 An international team of metal detectors working for Waterloo Uncovered has surveyed the field. Thus far, we have a few finds: musket balls, of which one stands out due to its small size. Other than that, we are uncovering litter of the past decades, including mostly bottle caps and soda cans. Please don’t litter, everyone – think of the disappointed future archaeologist pulling it out of the ground again! 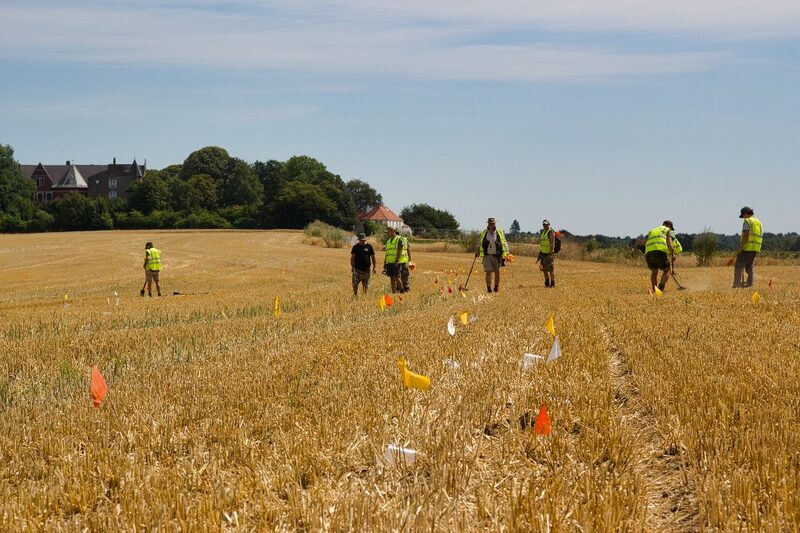 It’s possible that the field has already been heavily investigated by unlicensed metal detectorists -one of the ongoing risks to the fragile and important archaeology of the battlefield. Whilst surveying the site of the Inniskilling Square, we came across one find from a rather more recent conflict -the tail fin of a mortar bomb from World War Two. Luckily, the rest of the bomb was not attached anymore, but there was a risk that the explosive primer could still be live. We followed the standard procedure and the Belgian authorities swiftly showed up to take this remarkable find off our hands, and make it safe.